Mark Innerst, All the Above, 2010, Oil on panel, 15 ¾ x 19 ¾ in. Photo: Courtesy DC Moore Gallery. NEW YORK, NY.- DC Moore Gallery announces that it is beginning its representation of Mark Innerst with an exhibition of new paintings and works on paper inspired by New York City, Philadelphia, and the beaches of Cape May, New Jersey. A full-color catalog with an essay by Michael Duncan is available. Innerst transforms the urban landscape, investing it with a deeply resonant beauty and complexity. New York and Philadelphia appear alternately majestic, immense, and serene, as endless stretches of buildings morph into skyward-shooting lines or stacked, layered blocks of color. 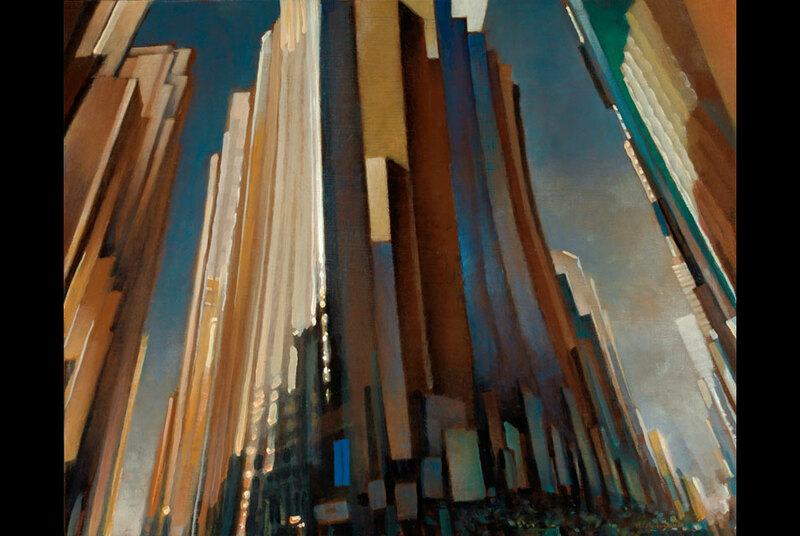 In work such as All the Above, the city appears organic and fluid, unfolding from within. Vanishing points slip off-center, crowded out by buildings that curve overhead and sweep downward to street level, where human activity is reduced to blurs of light and movement. Mark Innerst lives in Philadelphia, PA and Cape May, NJ. Recent exhibitions of his paintings have been presented at Alain Noirhomme Gallery, Brussels, Belgium (2008) and Galleria Mazzoli, Modena, Italy (2007). Innersts work is featured in numerous public collections, including the Museum of Modern Art, New York; Metropolitan Museum of Art, New York; Guggenheim Museum, New York; Brooklyn Museum of Art, NY; Albright Knox Museum, Buffalo, NY; and Indianapolis Museum of Art, IN.